In the previous episode of Starz’s Outlander, Fergus helped Murtagh escape jail, and Brianna forgave Stephen Bonnet. In the season finale of Outlander, Jamie, Claire, and Ian reached the Mohawk village, and Murtagh arrived at River Run. When Jamie, Claire, and Ian arrived at Shadow Lake, they claimed they were there to trade for Roger. They showed them a drawing of him, and the Mohawk recognized him. When Claire took off her scarf, they saw the stone she wore and made them leave. When Claire, Jamie, and Ian were about to make camp outside of the village, a group of Mohawks, including Wahkatiiosta, ambushed them. Wahkatiiosta wanted the stone. Claire asked her why it was important to her. She told them about Tawineonawira, or “Otter Tooth”, who showed up at Shadow Lake when Wahkatiiosta was a child. He seemed to be a time traveler like Claire and warned them to kill white men since they would be the death of their civilization. He incited violence among the tribe and came back with white scalps, so the Mohawk feared retaliation. Eventually, they killed him, and Tehwahsekwe buried his head and the stone far from the village. However, Wahkatiiosta believed the stone helped Tawineonawira see the future. Claire admitted she had a vision of him the night she found it. She agreed to give Wahkatiiosta the stone if she helped them get Roger back. Wahkatiiosta and her group of Mohawks snuck Jamie, Claire, and Ian into the village. As they got Roger out, a guard found them, and they were caught. Tehwahsekwe banished Wahkatiiosta and let Jamie, Claire, and Ian go, but without Roger. Jamie insisted to be traded for him, but Ian offered himself instead. When Claire, Jamie, and Roger left, Ian ran the gauntlet successfully, and the Mohawk welcomed him into the tribe. Murtagh arrived at River Run. Jocasta immediately knew about what had happened in Wilmington. 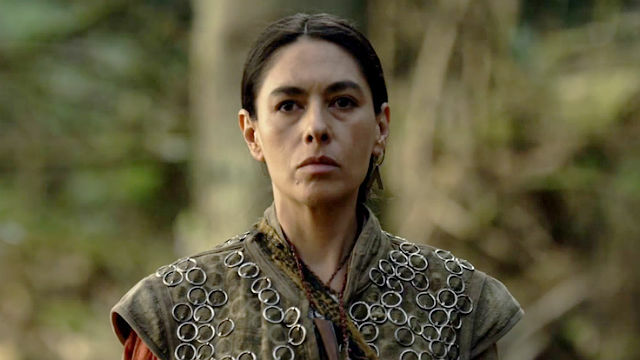 Murtagh urged her to use her influence for the cause, and Jocasta believed that was his reason for coming. Jocasta and Murtagh slept together that night. Brianna delivered the baby, though she still hadn’t married John. Two months later, Jamie and Claire arrived without Roger. They had told him everything that had happened to Brianna, including that the baby might not be his. However, just as Jamie, Claire, and Brianna were about to leave for Fraser’s Ridge, Roger rode up to River Run. Brianna ran up to meet him. Unfortuantely, a group of Redcoats rode up and interrupted their reunion. Everyone assumed they were there for Murtagh, and he hid. However, the Redcoats were there to deliver a letter from Gov. Tryon to Jamie. Gov. Tryon wanted Jamie to gather and lead a militia to hunt down and kill Murtagh. 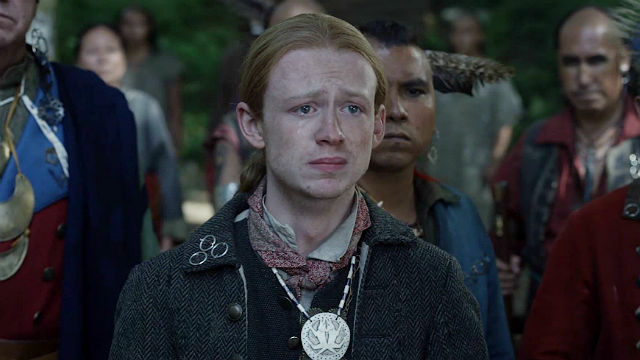 What did you think about Outlander season 4 episode 13? Let us know in the comment section below! The post Outlander Season 4 Episode 13 Recap appeared first on ComingSoon.net.